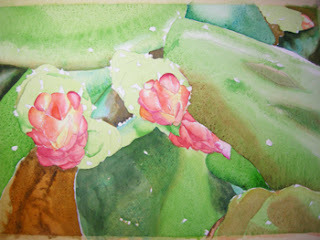 Back to the Cactus Flower lesson!!! Now it's time to add some depth and details. Using Hookers Green I have glazed over some of the other greens, especially where I added shadow glazes previously. I glazed this green over the parts of the leaves where the cool Cerulean Blue was applied earlier. Now the yellow greens in the sunlit areas begin to contrast more with the cool blue-greens of the other areas. Look at your photo reference carefully and you will see that none of the green areas can be painted exactly alike because the light hits each leaf differently and each leaf has a small shift in color from the others. I have also used VanDyke Brown in a richer mixture than before and developed some details in the lower left area of the painting. This area in the reference had some woody growth, and I wanted to capture a bit of that. I also liked how it warmed up that corner of the painting. I have worked around the painting adding small touches and glazes for depth and interest. To see more of this lesson, please visit earlier posts.